The interdisciplinary team at Flatirons is skilled at working with patients with a wide variety of medical and surgical concerns. Your length of stay will vary based on your goals and your progress. Our goal is for every patient to progress as quickly as is possible. Each patient has the benefit of receiving the skills and expertise of many professionals. Physicians, nurses, social workers, rehabilitation specialists, and nutritionists work together with you. They guide your care plan according to your needs. Recovery does not end when you leave Flatirons Health and Rehab. Your Therapy team will recommend a plan for "home", wherever that may be. We are excited that we will be using Biodex equipment in our therapy gym. The most current and effective equipment on the market, it allows us to electronically track patient progress on a daily basis. Accurate data will keep us all on the right track helping us move our patients efficiently toward successful outcomes. For more information on Biodex equipment and information click here. The therapy department at Flatirons is excited to welcome patients with a wide variety of therapy needs. We aim to have a team made up of Physical, Occupational and Speech therapists, who collectively have experience in many different areas. Our mission and purpose is in keeping with Axiom’s mission of Improving Lives and Exceeding Expectations. We endeavor to help our patients achieve THEIR goals, and maximize their functional potential for best possible quality of life. Flatirons has therapy services available seven days a week, and has equipped the gym with state of the art equipment. Each person entrusted to our care is seen as a whole being, and we work collaboratively with all disciplines (doctors, nurses, specialist etc.) to create individualized plans of care. As therapists, we see ourselves as mentors and coaches; we want our patients to take an active role in their rehab stay, as patient and family activation are key drivers of successful rehab outcomes. Communication is key, and you will be able to reach a therapist even outside of normal work hours if needed. Physiatrists have medical knowledge of pathology, pathophysiology, assessment of cognition and behavior, indications for use of physical agents and activity as well as pharmacologic agents. are medical specialists in physical medicine and rehabilitation. They can provide guidance to the rehab team in order to minimize disability and maximize independence. Physiatrists have medical knowledge of pathology, pathophysiology, assessment of cognition and behavior, indications for use of physical agents and activity as well as pharmacologic agents. It is also beneficial to have a physiatrist on the team as a consultant and co-physician in the care of a patient, as they can provide other services such as joint aspiration and injections that would otherwise necessitate waiting for an appointment out of the facility. The addition of a physiatry services typically results in optimal outcomes and the best quality of life. Healogics has developed successful wound healing and prevention techniques. They provide the nurse consultants we use to address wound care. These nurses are experts in wound healing. Visit their website at www.healogics.com for more information about their care. Your Flatirons nurses can provide information about the wound management program here at Flatirons Health and Rehab. Optimal results from any exercise program are determined by appropriate intensity and duration of exercise. It is important to increase intensity and challenge balance for best outcomes. Many patients fail to achieve proper intensity due to fear of falling and physical limitations of strength and endurance. 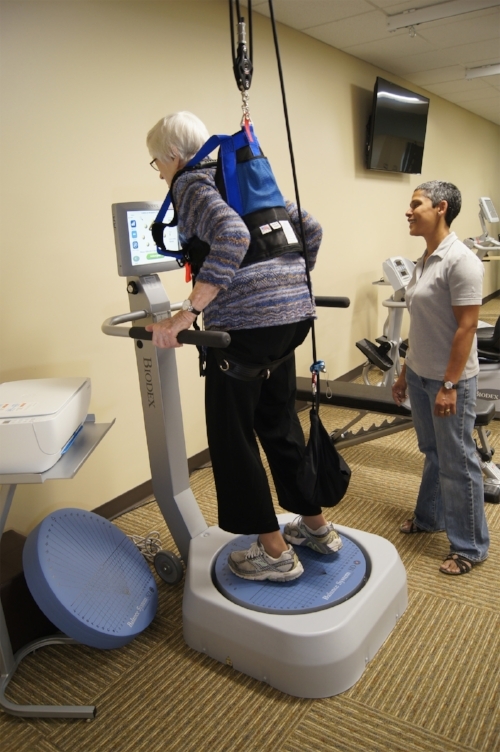 Use of a safety harness can help patients allow themselves to reach optimal intensity without fear of falling. Challenging activities like stair training and gait can also be introduced early in the rehab process. This machine provides audio and visual feedback, giving information about step length, step speed and right-left symmetry. The machine provides feedback to the patient in real time that allows for correction of gait deviations. Progress can be recorded and printed for reference. Emulates natural walking patterns with minimal joint impact and the comfort and stability of semi recumbent positioning. Reciprocal motion of upper and lower extremities allows for increased strength, range of motion and endurance in a seated position. This balance system allows for testing and retraining of balance. This machine is useful to identify fall candidates and permit early intervention by identifying which components of balance are affected, and train patients accordingly. Provides fall risk score based on age related normative data. The program can be recorded and printed. Enables patients to practice sit-to–stand with varying levels of assistance provided by the machine. Assistance is decreased as the patient gets stronger. This leg/upper arm body trainer allows for patients with multiple neurological and geriatric diagnoses such as Multiple Sclerosis, Stroke, Parkinson’s etc. to use Passive, Motor- Assisted or Active Resistive cycle motions. Dual stack cable and weight functional trainer. Use of modalities makes it possible to optimize pain management. This offers the benefits of early participation in rehab while minimizing side effects of pain medications. What level of care giving is available at home? Will this be enough? May we help connect you with a support group? Do you need equipment for home or to be able to go out in the community? Do you need the help of a handyman to install safety bars or build a ramp? Do you need assistance with grocery shopping or meal preparation? Do you need prescriptions delivered to your home? Are you able to get meals every day? Are there other things that worry you? Do you need help moving to a new residence? Who do I want to speak for me if I cannot make my needs known? We want to be certain that you have a smooth transition after your stay with us. When needed we refer to our partners who specialize in other types of care. Home Health: These companies offer Physical Therapy, Occupational Therapy, Speech Therapy, Personal Care Providers, and Nursing assistance to help at home. This may be covered by your insurance. Home Care: Typically insurance does not cover these costs. The staff from these companies help with dressing, bathing, cooking, light housekeeping, transportation, and the like. Memory Care: Structured settings for people with significantly declining memory, when it is not reasonable to be at home. Independent Living Facilities: Handicapped accessible living with many levels of services available. Assisted Living Facilities: Supportive environments with varying levels of care with health care, medication, meals, transportation, activities. Long Term Care: 24 hour medical care with meals, and individualized assistance with all aspects of personal care. Comfortable, easy clothing to put on and take off. Your laundry will be done separately from others. Socks and shoes that provide good support. Cell phone and charger, other electronics if they are important to you. Contact information for your family. Container and batteries for hearing aids. CPAP machine or other healthcare devices. Your knitting project or your favorite CDs, or whatever gives you pleasure for your rest and relaxation.